One of the global (basic) rights of infants, as advocated by the World Association for Infant Mental Health, is, "Right to caregiving relationship that is sensitive and responsive to infant needs." This year, we were fortunate enough to attend the annual conference of Zero to Three in San Diego. What an amazing opportunity for learning! Over the course of the conference, we attended workshops on topics like infant mental health, toddler emotions, immigrant and refugee children, and using learning stories for documentation and assessment. Spending time with 3,500 like-minded professionals was pretty fantastic. Where else but at this conference can you walk down a hotel corridor and overhear things like, "That's the brain's temporal lobe ..." or, "When we do yoga in the classroom..."
Being able to enjoy some San Diego sunshine and Mexican food was definitely the icing on the cake. One of the topics that we spent some time learning about was the use of mindfulness practices in parent coaching and support, and this is something that we're eager to reflect on and strategize on incorporating into our own practices. We attended a workshop entitled "Safe, Secure, and Loved," which was led by Barbara Burns, a developmental psychologist at Santa Clara University. Burns and her students partnered with the community to implement a program aimed at strengthening self-regulation skills in families. Their goals include building emotional resilience in children through their parents. Burns and her team are not the only ones studying and incorporating the use of mindfulness in parenting. Mari Rossi, who teaches mindfulness parenting courses, says that research shows that using mindful parenting techniques is not only beneficial to the parent-child relationship but also has a positive impact on both the parent and the child individually. Our experience has shown that parents and teachers all speak of being "present" with young children and enjoying the magical moments that make a life ("the days are long but the years are short"), but it's important to understand that true mindfulness is an ongoing practice. In the workshop that we attended, Burns and her co-presenters Roberto Gil and Maria Gallardo talked about making these practices a part of familiar everyday routines in the family home. This is when practice becomes meaningful and, over time, second-nature. Mother Theresa famously said, "If you want to change the world, go home and love your family." It is within the context of family and home that young children will optimally begin to develop the skills required for emotional resiliency. From the stories of success shared in this workshop, we learned that adopting mindfulness habits can help parents to feel empowered, engaged, and successful in their parenting practices. Some of the skills that Burns and her team said are of most value included the practice of dropping "the anchor of resilience." This is another way of saying, "be present," or, "slow your roll." It's a way of reminding yourself that the best starting point in a moment of stress or upset is always finding (and being) where you are. Close your eyes to center yourself. Take some deep breaths. Learn to do these kinds of calming things before reacting to a situation. That is, when your toddler is having a tantrum, take a moment to check in with yourself before you respond. You may want to take a moment to identify what it is you're feeling: angry, scared, embarrassed, etc. Just as on an airplane parents are advised to situate their own mask before assisting a child, parents must be aware of their own feelings before helping a child to regulate theirs. Burns and her team talked about encouraging parents to embrace an attitude of self-compassion. That is: be kind. Forgive yourself for mistakes. Understand that mistakes are a way of learning and a path forward. When you're able to stop judging yourself so harshly, you will find that the ripple effect of compassion will extend to your wider community. What a wonderful thing to model for your children! Our favorite thing that was spoken of in this workshop was the way that, in this experimental model, parents were able to gather together to learn these new skills of mindfulness and to share their experiences with one another. We are reflecting on how we can provide a similar space for families that we work with, or others in our community. As we move into 2018, we will be sharing more about what this might look like for our program. We welcome all suggestions and feedback! You find many examples of intentionally creating loose parts play for young children in Reggio-influenced programs and in RIE, which are two ways of thinking about work with young children that we are influenced by as educators. In the more recent AnjiPlay movement emerging from China (http://www.anjiplay.com/home/), you will find fantastic examples of large loose parts play that involves gross motor development and risk-taking, along with creativity and socio-emotional skills like cooperation and conflict negotiation. As adults, it's fascinating to watch what children will do with the loose parts in the environment. In our program, some of the parts have been selected and thoughtfully presented by the teachers. Others have been sourced by the children themselves. 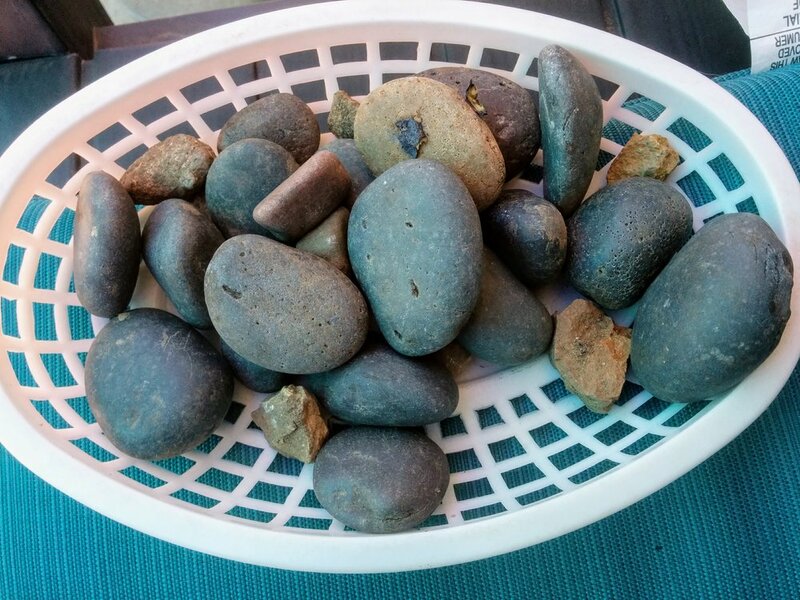 This basket of rocks, for example, was collected by two toddlers working both together and separately over a period of days. These rocks have represented "porridge" in their sociodramatic play, have represented bugs, have been compared to balls, and were today gathered up and given away as "money." We're inspired every day by the limitless potential of their imaginations!